Common Name: Lindera root, Spicebush root. Part Used & Method for Pharmaceutical Preparations: The roots are dug in August. After the fibrous roots and bark have been removed, the roots are cut into slices and dried in the sun. Meridians: Lung, spleen, kidney and urinary bladder. Functions: 1. To regulate qi and stop pain; 2. To warm the kidneys and dispel cold. 1. Cold and qi stagnation: a) manifested as stifling sensation in the chest and costal painLindera root (Wuyao) is used with Trichosanthes fruit (Gualou), Curcuma root (Yujin) and Bitter orange (Zhiqiao); b) manifested as epigastric and abdominal distension and painLindera root (Wuyao) is used with Costus root (Muxiang); c) manifested as painful swelling of testicles or scrotum, or hernia. Lindera root (Wuyao) is used with Fennel fruit (Xiaohuixiang) and Green tangerine peel (Qingpi) in the formula Tiantai Wuyao San; d) manifested as dysmenorrheaLindera root (Wuyao) is used with Cyperus tuber (Xiangfu), Chinese angelica root (Danggui) and Chuanxiong rhizome (Chuanxiong). 2. Kidney yang deficiency and deficiency and cold of the urinary bladder manifested as frequent urination and enuresis. Lindera root (Wuyao) is used with Bitter cardamom (Yizhiren) and Dioscorea (Shanyao) in the formula Suoquan Wan. 3. For tightness in the chest and pain in the hypochondriac region due to Stagnation of Cold and Qi, it is used with Bulbus Allii Macrostemi (Xie Bai), Pericarpium Trichosanthis (Gua Lou Pi), Radix Curcumae (Yu Jin), and Radix Curcumae Yanhusuo (Yan Hu Suo). 4. For distension and pain in the epigastrium and abdomen due to Stagnation of Cold and Qi, it is used with Radix Aucklandiae (Mu Xiang), Fructus Evodiae (Wu Zhu Yu), and Fructus Aurantii (Zhi Qiao). 5. 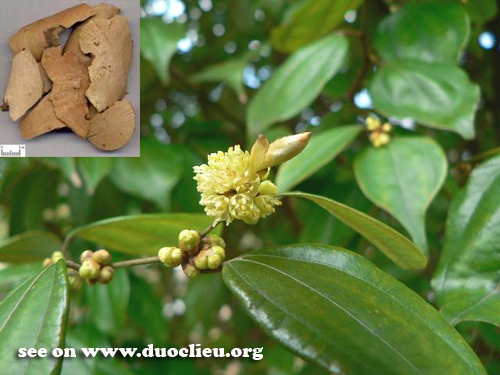 For periumbilical colic due to invasion by Cold, it is used with Fructus Foeniculi (Xiao Hui Xiang), Radix Aucklandiae (Mu Xiang), and Pericarpium Citri Reticulatae Viride (Qing Pi) in “The Linderae Powder” (Tian Tai Wu Yao San). 6. For dysmenorrhea due to Stagnation of Cold and Qi, it is used with Rhizoma Cyperi (Xiang Fu), Radix Angelicae Sinensis (Dang Gui), and Radix Aucklandiae (Mu Xiang) in “The Linderae Decoction” (Wu Yao Tang).